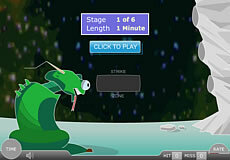 High school math games - learn high school math the fun way. Yes you can learn math in a fun relaxed way. You can practise your skills without even noticing. With a cool math game you'll find yourself doing more math. More math practise means results. When you're relaxed you'll remember important math concepts more easily. So math games are great for exam revision. Or for learning something new. We've collected here a number of cool math games for high school students. You'll practise numeracy, fractions, algebra, geometry and more. But you'll also develop logic and spatial skills, lateral thinking and calculation skills. Basically you'll be developing the math side of your brain. Develop your logic skills. 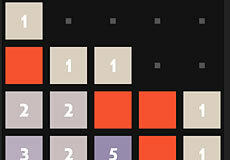 In this game you'll create wonderful designs, but you'll need to puzzle out correct sequence. Great brain teaser. 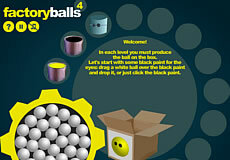 Play Factory Balls online. Here's one to develop your spatial aweness - a geometry skill. 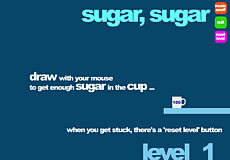 Play Sugar Sugar online. Number and logic. Perfect! Based on tetris, but with numbers. Play 25 online. A great geometry game. 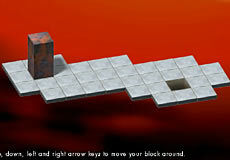 Manipulate 3D solid shapes to build more complex shapes. Play Isoball online. Fun introduction to ratios. How to identify ratios. Play Ratio Martian online. Help some lost aliens find their way by setting the correct angle on the rescue launcher. A fun geometry game. 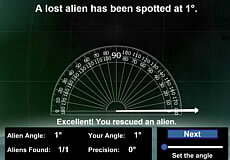 Play Alien Angles online. A bit trickier than Ratio Martian - this time you'll be finding equivalent ratios. Play Ratio Blaster online. More geometry fun. This time with transforming shapes - using rotation and mirroring. 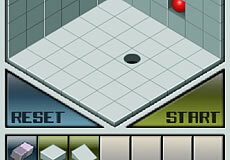 Play Shape Transformer online. Develop your mental math skills. Quick addition is a must. Good numeracy game. 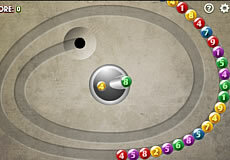 Play Math Lines online. Another fun way of learning equivalent ratios. Single or multi-player. 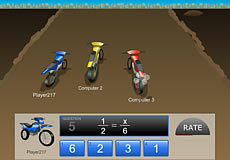 Play Dirt Bike Proportions online. Cool geometry game. Flip, move, and rotate your block around various puzzle boards. 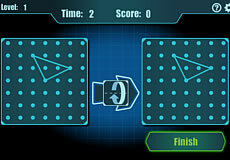 Play Logic Blockorz online. 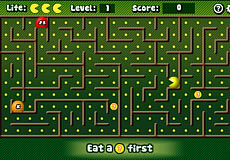 Just like pacman, but with a math twist. Super cool!Think, think, think! 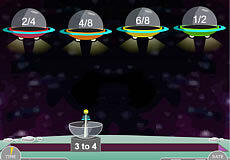 Play Math Man online. A study by the Proceedings of the National Academy of Sciences, shows that playing action video games improves the skills taught in the game AND your learning capabilities generally. The researchers used various experiment to test game players vs non-game players. They found that action players outperform non-action players in pattern discrimination, with their brains using a better template to the task at hand. Additionally, they found that action players, when given a perceptual learning task, were able to build and fine tune templates much faster than non-action game control particpants. To be a better learning you need to be able to develop the right templates quicker, and playing action video games boosts this process. While playing action games has come under a lot of criticism, new studies all the time are finding that those who play action games have better motor skills and learn things faster in general. There also seems to be no link between violence in video games and real life. Interestingly, it seems that players also hold onto learnt skills longer than non-players. Meaning that something learnt seems to remain longer in the brain. Why logic games and brain teasers are good for you. Just like you need to exercise your body to keep it healthy, you need to exercise your brain! If you exercise your brain it works better for longer, improves your memory and makes your though processes clearer. How do I exercise my brain? By learning new things, having stimulating conversations with other people, spending social time with family and friends AND doing logic puzzles and crosswords. All these activities will stimulate the brain by increasing connections between the brain cells.